Heru means He who is above. As such, Horus (Heru) represents the realized divine principle. Heru (Horus) results from the heavenly marriage between Isis and the holy ghost of Osiris. As the model of earthly existence, Horus is represented in several forms and aspects corresponding with the stages in the process of spiritualization, and is not just limited to being a falcon-headed deity. The ninth Stanza of the Ancient Egyptian Leiden Papyrus J350 recalls the Grand Ennead, the first nine entities that came forth from Nun. The first of the Grand Ennead was Atam, who came into being out of Nun, the cosmic ocean. Atam then spat out the twins Shu and Tefnut, who in turn gave birth to Nut and Geb, whose union produced Osiris, Isis, Seth and Nephthys. The nine aspects of the Grand Ennead emanate from, and are circumscribed about, The Absolute. They are not a sequence, but a unity—interpenetrating, interacting, and interlocked. Since the human being is a universal replica, a human child is normally conceived, formed, and born in nine months. Number 9 marks the end of gestation and the end of each series of numbers. 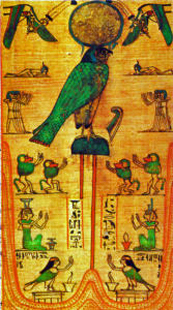 Horus as number 10 is the highest number of the original unity. At ten, Horus is a new One. As such, he represents the return to the Source and thus becomes the initiate deity, as will be discussed further, later herein. In the Ancient Egyptian traditions, the active faculties of Atam—and thus the Great Ennead—were intelligence, which was identified with the heart and represented by Horus, a solar neter (god); and action, which was identified with the tongue and represented by Thoth—a lunar neter (god). “There came into being as the heart (Horus), and there came into being as the tongue (Thoth), the form of Atam”. “The Heart thinks all that it wishes, and the Tongue delivers all that it wishes”. The significance of heart and tongue permeates Ancient Egyptian texts and was subsequently adopted in “Sufism”. Horus represents conscience and will, and is identified with the heart. Thoth represents deliverance and manifestation, and is identified with the tongue. The combined action of Horus and Thoth governs the actions of all living organisms—large and small. Each action, voluntary or involuntary, is the result of cause and effect. As such, Horus represents the cause and Thoth represents the effect. “The Heart and the Tongue have power over all . . . the neteru (gods), all men, all cattle, all creeping things, and all that lives. The Heart thinks all that it wishes, and the Tongue delivers all that it wishes”. – The most depicted duality in Ancient Egypt is that of Horus and Thoth, solar and lunar deities. – Horus = closed bud/conscience and Thoth = open blossom/manifestation. In Ancient Egypt, the symbol for a star was drawn with five points. The Star was the Egyptian symbol for both destiny and the number five. Horus is the personification of the goal of all initiated teachings, and therefore is associated with the number five; for he is the fifth, after Isis, Osiris, Seth and Nephthys. “Three [Osiris] is the first perfect odd number: four is a square whose side is the even number two [Isis]; but five [Horus] is in some ways like to its father, and in some ways like to its mother, being made up of three and two. And panta (all) is a derivative of pente (five), and they speak of counting as “numbering by fives”. The significance and function of the number five in Ancient Egypt is indicated by the manner in which it was written. The number 5 in Ancient Egypt was written as 2 (II) above 3 (III), or as a five-pointed star. In other words, number 5 is the result of the relationship between number 2 and number 3. Two symbolizes the power of multiplicity – the female, mutable receptacle – while Three symbolizes the male. This was the ‘music of the spheres’; the universal harmonies played out between these two primal male and female universal symbols of Osiris and Isis, whose heavenly marriage produced the child Horus. 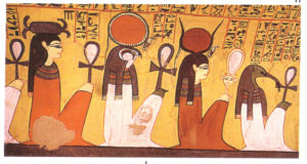 Stanzas 50 and 500 of the Ancient Egyptians’ Leiden Papyrus J350 (whose first word dua means at the same time five and to worship) consists of hymns of adoration exalting the marvels of Creation. The history of political and doctrinal struggles within the Church during and after the 4th century has largely been written in terms of the disputes over the nature of God and Christ and the relationship between them. All the “apparent” conflicting theories about these natures can be explained in the Ancient Egyptian context of the relationship between Osiris—the Father—and his Divine Son—namely, Horus. In a way, Osiris and Horus were complimentary; each of the other. The Egyptians believed in the anthropomorphic divinity, or Horus, (Christ) ideal, whose life in this world and the world beyond was typical of the ideal life of man. 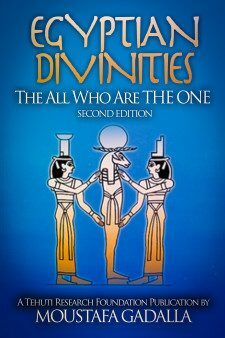 The chief embodiments of this divinity were Osiris and his son, Horus (Christ). Neither, however, was ever regarded as historical. Osiris represents the mortal man carrying within himself the capacity and power of spiritual salvation. Every Egyptian’s hope was/is resurrection in a transformed body and immortality which could only be realized through the death and resurrection of Osiris within each person. Osiris symbolizes the subconscious—the capacity to act, to do; while Horus symbolizes consciousness: will and the potential to act; to do. Now that we talked about the father-son relationship, we follow by talking about the relationship between the son and his Virgin Mother Isis. Isis’ role in the Egyptian Model Story and the story of the Virgin Mary are strikingly similar; for both were able to conceive without male impregnation. Horus was conceived and born after the death of Isis’ husband and, as such, she was revered as the Virgin Mother. More information is to be found under Isis in the next chapter of this book and in the book Ancient Egyptian Roots of Christianity by Moustafa Gadalla. Like the Biblical Jesus, Horus was always followed or accompanied by disciples. 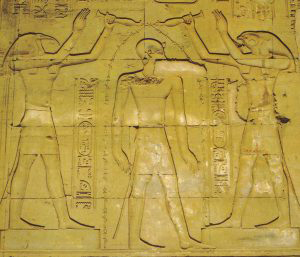 Sometimes they are depicted in all human form, following Horus behind the Bird of origin, Bennu. In funerary scenes, the four disciples (sons) are depicted as little mummiform figures standing on an opened lotus. 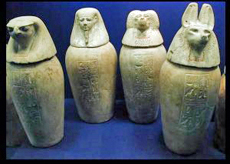 More about the metaphysical significance of the body parts contained in the jars are in the next chapter of this book, under the listed netert (goddesses). In the Egyptian allegorical model story, there are a series of battles between Horus and Seth. Such illustrates how life is a continuous quest for the divine within ourselves, as symbolized by Horus and Seth. The archetypal inner struggle in the Egyptian model is symbolized in the struggle between Horus and Seth. It is the archetypal struggle between opposing forces. Horus, in this context, is the divine man, born of nature, who must do battle against Seth, his own kin, representing the power of opposition and not evil in the narrow sense. Seth represents the concept of opposition in all aspects of life (physically and metaphysically). We must continuously learn and evolve, like Heru (Horus), whose name means He Who is Above. In other words, we must strive to reach higher and higher. We learn and act by affirmation of the Horus in each of us, and by negating the Seth within us. The obstacles within each of us, represented by Seth, must be controlled and/or overcome. Such obstacles are the ego, laziness, overconfidence, arrogance, evasiveness, indifference, etc. In the Egyptian model, Seth represents the wilderness and foreign aspects within each of us. It is therefore that in Ancient Egyptian temples, tombs, and texts, human vices are depicted as foreigners (the sick body is sick because it is/was invaded by foreign germs). Foreigners are depicted as subdued—arms tightened/tied behind their backs—to portray inner self-control. 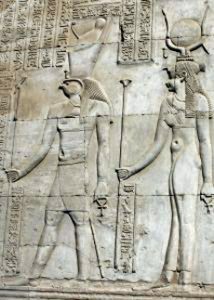 The most vivid example of self-control is the common depiction of the Pharaoh (The Perfected Man) on the outer walls of Ancient Egyptian temples, subduing/controlling foreign enemies—the enemies (impurities) within. Heru (Horus), in the Ancient Egyptian language, means He who is above. As such, Heru (Horus) represents the realized divine principle. Heru (Horus) is the personification of the goal of all initiated teachings, and is always depicted accompanying the realized soul to the Source. 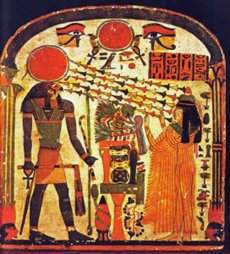 In the Ancient Egyptian allegory, Heru (Horus) brought Ositis to life. On Judgment Day, Horus shows the Way to Osiris. He acts as a mediator between the deceased and Osiris. All Egyptians wanted/want Horus to bring them (dead) to life. Likewise, in Christianity the Christian motif was/is based on the need for a mediator – a son of god – as an all-powerful shepherd and a begotten savior living among the common man. “I am the victorious one . Our progression is symbolized by Horus. One of his “titles” is the Lord of the Ladder. As the model of earthly existence, Heru (Horus) is represented in several forms and aspects that correspond with the stages in the process of spiritualization. 1. Hor-Sa-Auset, which means Horus, Son of Isis (Horsiesis or Harsiesis). He is often shown as an infant being suckled by Isis, which is identical to the later Christian representation of the Madonna and her child. In the lifespan of a person, this is the age of total dependency. 2. Heru-p-Khart/Hor-Pa-Khred, which means Heru the Child. Harpocrates. He is often shown with his forefinger on his mouth, symbolizing the taking in of knowledge. This is the age of learning, with an inquisitive mind. 3. Horus Behdety or Apollo is Heru, who avenged the death of his father and flew up to heaven in the form of a winged disk. This represents the stage in our lives of working and struggling to achieve higher spiritual realms so that one can fly up to heaven, victorious. 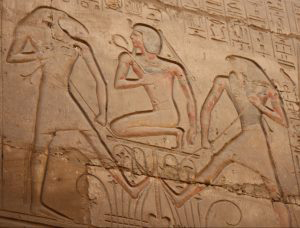 Depictions of Horus Behdety are found in most Ancient Egyptian structures, but more prominently at the Edfu Temple. 4. 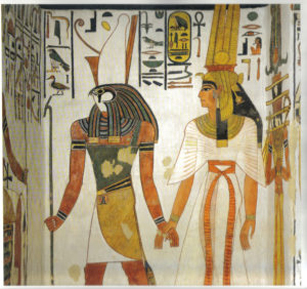 Heru-ur, which means Heru (Horus) the Elder or Heru the Great or Haroeris/Harueris. Heru-ur (Haroeris) is usually depicted as a hawk-headed male divinity wearing the double crown. This represents the stage of reaching the age of wisdom; and hence the title, Heru the Elder. Heru-ur (Horus) The Elder is depicted in numerous Ancient Egyptian temples, but more prominently at Kom Ombo. 5. Hor.Akhti/Horachti, which means Horus on/of the Horizon—a form of a new morning sun. Harmachis is its Greek rendering. Hor.Akhti signifies the renewal/new beginning; a new day. This will be manifested in the form of Ra-Hor.Akhti. Also see Re-Hor-Akhti below, in this chapter. Het-hor is commonly translated by western Egyptologists as “house of Horus“. The first part—Het, translated as “house”, has a bigger meaning than a simple house. It actually means the womb as a Matrix within which something originates, takes form, and develops into full maturity. Horus represents the realized divine principle—and Horus is recognized by various names/attributes as he develops from infancy to maturity within the cosmic womb. The final destination is unification with the creator as Re. At this point, the realized soul becomes Re-Hor-akhti. It is therefore that Het-hor is called the Lady of the West, residence of Horus—as Re-Hor-achti. The realized soul reaches the ultimate goal depicted as falcon in green, the color of rejuvenation/renewal. Hail to the Glorious One. More about Hathor (Het-hor)in the next chapter of this book.